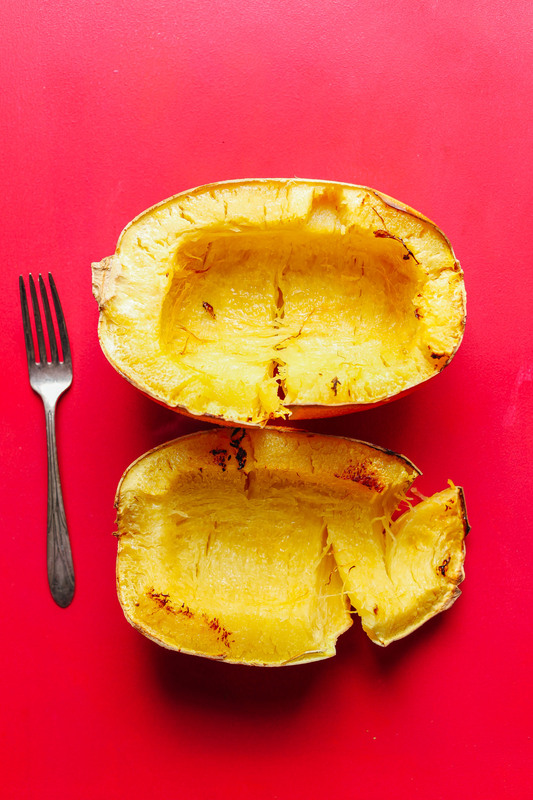 If you’ve ever wondered how to cook a spaghetti squash, you’ve come to the right place. Let me show you how with this step-by-step tutorial! 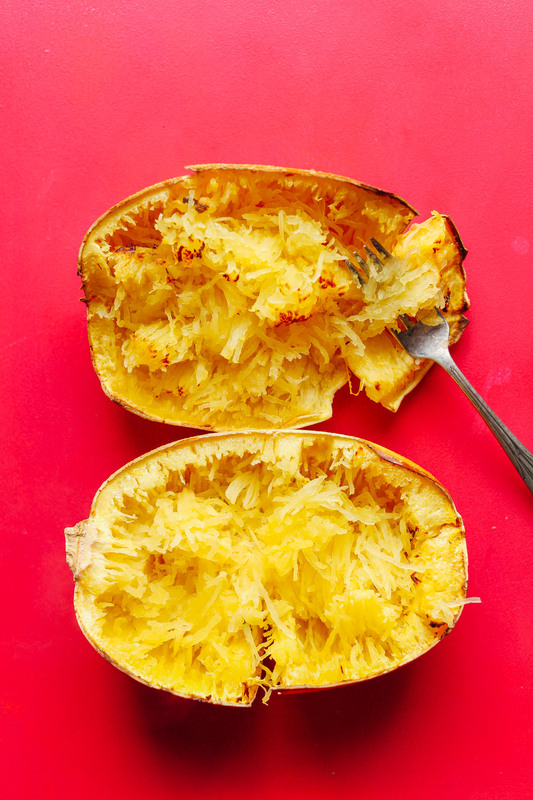 You’ll have ready-to-eat spaghetti squash on the table in less than hour. It all starts by halving your squash and scooping out your seeds, which I love to do with an ice cream scoop for efficiency. Then, it’s into the oven to roast. You can either go for an oil-free version with some water added to the pan for moisture, or – my preferred – brush the inside with a little oil and sprinkle of salt and roast in a 400-degree oven for 45 minutes or until fork tender. Then it’s the fun part! Use a fork to make “spaghetti noodles” out of the squash, at which point it’s ready to enjoy with a little olive oil, vegan parmesan cheese, and sprinkle of salt and fresh herbs, Easy Vegan Pesto, or red sauce! For more recipe ideas, check out my Spaghetti Squash Lasagna and Pesto Spaghetti Squash Pasta. This would also sub well for pasta in my Simple Vegan Meatballs, Vegan Roasted Red Pepper Pasta, and Simple Chickpea Bolognese! If you try this recipe, let us know by leaving a comment and rating below. And don’t forget to tag a photo #minimalistbaker on Instagram so we can see what you come up with. Cheers, friends! 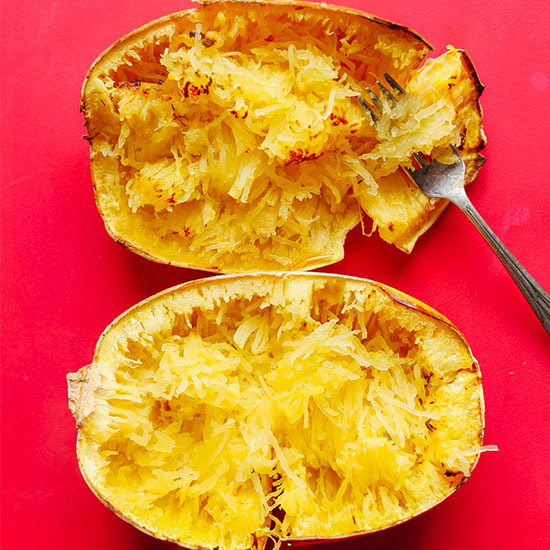 An easy, step-by-step tutorial on how to roast spaghetti squash. The perfect base for things like lasagna, pasta dishes, soups, and more! Preheat oven to 400 degrees F (204 C) and line a large rimmed baking sheet or baking dish with parchment paper or foil. 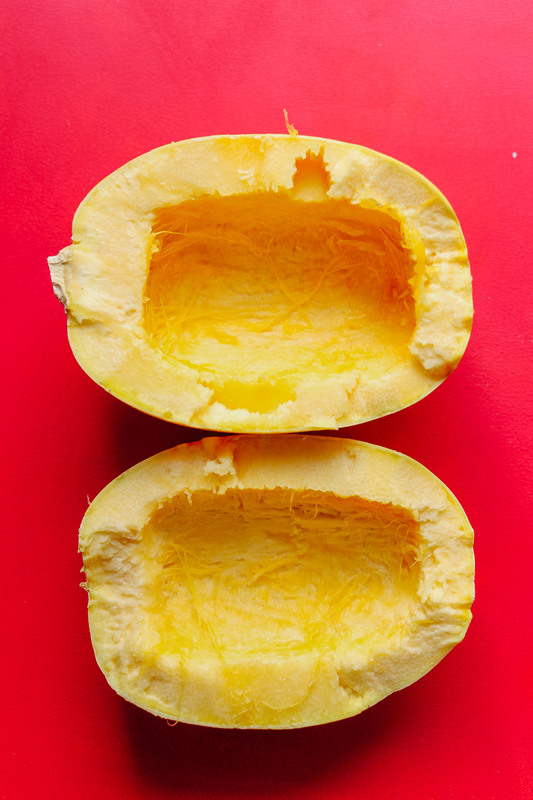 Carefully halve spaghetti squash lengthwise using a sharp knife. I find the best way to do this is inserting the very tip of a very sharp large knife into the side of the squash (lengthwise) and push it all the way through to the other side. Then rock the knife back and forth to cut one half all the way through, then repeat on the other side. Use an ice cream scoop (or sharp spoon) to scrape out the seeds and most of the stringy parts. Note: For a more moist squash, omit the oil and instead add just enough water to cover the bottom of your baking sheet or baking dish and bake at 400 degrees F (204 C) until a knife easily pierces the exterior - about 35-45 minutes. Once slightly cool, flip squash flesh-side up and use a fork to scrape out the strings. For ideas on how to use your spaghetti squash, see the text links above! *Nutrition information is a rough estimate calculated with oil and salt, and without additional toppings / garnishes. One of my most favorite sides. Thanks for the recipe. I am off to indulge. I cook mine in the microwave face up with a little water in it. For about 10-12 minutes on high. I followed the instructions to cut the squash. I used EVOO and a pinch of sea salt. I baked them in a 400 degree oven, cut side down, for 55 minutes. It was delicious. Easy and delicious. Our dinner was unexpectedly delayed, so it cooked an extra 45 minutes. Other than blackening the top edge of the squash (which I had oiled and placed facedown on foil), it survived the wait very well. Just add spaghetti sauce and consume! Yum. This was my first spaghetti squash experience. I made it exactly as directed and then sprinkled it with a bit of oregano, pepper and parmesan cheese after shredding. Delicious! Whoop! We’re glad to hear that, Elena! I’ve used this recipe several times, works great but as others have mentioned I think a lot has to do with the individual squash. Lately I have been making a “taco squash” While the squash is baking, I fry up some cut up onion, bell pepper (whatever color you like) and jalapeno pepper, then brown some lean ground turkey in this mixture (like taco filling). Also add Taco seasoning to taste/salt and pepper (Trader Joe’s has a great taco seasoning in small packets called TACO MIX). I use about 1/2 packet. Then when the squash is done, I scrape the inside keeping the “noodles” in their squash boats, top with a pile of the cooked meat, cover with shredded mexican cheeses and then put back in the oven at 350 for about 10 minutes or when the cheese is all yummy and gooey! Serve with salsa, sour cream and cilantro! Delish! One large squash can feed 4 people, just cut into quarters after baked (before adding the meat mix), use fork to make the noodles and bake with cheese. Great as leftovers too. Put it whole into a microwave for 3 or 4 minutes to make it easier to cut. Thanks for this tip! Does it need to be pierced at all before microwaving? My first try preparing a spaghetti squash and it was a complete success!! Great instructions. The only challenge was getting it cut in half – whew that was tough! While roasting (according to your recipe), in a large frying pan, saute 1 diced purple onion in 1 Tablespoon olive oil until carmelized. Then add 2 minced cloves of garlic, saute for a minute, add 2 small diced zucchini until lightly brown. Then add 1 can of diced tomatoes with its liquid or 1 cup of cherry tomatoes cut in half and continue cooking for a few minutes. Add any spices you would like, such as basil, oregano and/or thyme. Cover with lid to keep warm. When the spaghetti squash cools a little, scrape the strands into a bowl and then add it to the tomato mixture, stirring until mixed. Cook for a few minutes until heated through. Can add chicken broth to moisten for more of a sauce. Enjoy! I added some freshly minced garlic in the oil before I brushed the inside of the squash. Amazing!! Even my teenagers loved it! I liberally brush the inside of the squash with butter and bake as directed. Once done I flip the squash cut side up, sprinkle with brown sugar and bake for an additional 5 to 8 min. Super yummy and the kids love it! I like your instructions for roasting spaghetti squash. I haven’t had pasta for so long and I don’t even miss it. I just pop the whole thing on a cookie sheet and slow roast for an hour at 400. Keeps it nice and moist, too. I was skeptical at first because i have never made this before. Thank you so much these instructions were perfect. I used this recipe as the base then added a black bean and veggie medley tomato sauce on top. Excellent will be doing this again! Check out her chickpea bolognese as well. We are so glad you found the post helpful, Samm! I agree about the ice cream scoop! Made the whole seed removal so much easier! When looking for recipes I often find the Minimalist Baker to be the “go to”. I just don’t want mushy noodles.. I’ve tried this method and still have a hard time. I want a spaghetti like texture! Please help! I’d just cook for less time, Janae! I love to split mine, brush with melted butter and drizzle the inside with maple syrup then a sprinkle of salt. Roasted top side up for about an hour on 400 degrees….enjoy! I’ve so sick of boring, unseasoned, boiled spaghetti squash, and never understood the appeal. Thank you for sharing this recipe! I did your recipe just as you instructed, with these variations: I used grapeseed oil and pink Himalayan salt, but slathered the flesh with crushed garlic (Christopher Ranch brand). After I took it out of the oven, I drizzled rosemary infused olive oil over it and worked it into the “noodles” with a fork. It was HEAVENLY! I’ve many times made spaghetti squash cut side up with no water (less mushy) and cut side down in water ( mushy) and the issue of crunchy or “undercooked” strands has more to do with the individual squash, it’s age, moisture content etc. which is not something you can tell before cooking. I’m not vegan and will sometimes mix pasta and spaghetti squash together to lighten the amount of simple carbs in the dish and it works well. No where in the recipe does it say to distinctively place the cut side face down. I had to look for it in the comments, you are supposed to put in an oven pan: either water or brush the spaghetti squash in olive oil after you remove the seeds (brush the spaghetti strands with oil) and salt the squash. This would be a clear and concise method. But I am giving you only two stars for in-completion. It was a good squash. I would also advice to put in a vodka sauce heated up on the stove or a regular tomatoe sauce, add it to the squash and it as spaghetti straight out of the squash! Yum! Yum! Yum! if you don’t mention the marinara, folks will be missing out! Bec, it says that in step 4. Yes. It sure does and mine is great! Thank you for the recipe! In-completion? I give you 2 stars for not being able to read, and for not knowing incompletion. It says “place cut side down on the baking sheet”. And to serve it with marinara. So ???? I made this tonight with a few little tweaks… I brushed the cut halves with olive oil and minced garlic for added flavor. Once done, I placed the strands directly back into the same casserole dish in a nice even layer. I then switched oven to broiler and placed for additional 10 minutes, stirring halfway through. Delicious! Curious, how do I keep it from coming out crunchy? I’ve been roasting it for well over an hour but it’s still just really crunchy. I’ve never worked with spaghetti squash before so I’m wondering if that’s just how it is, or if I’m doing something wrong. Cutting it in rings will make it have longer strands. Also, I saw in another post to salt it and let it sit for about 20 minutes. It draws out some of the moisture, making it less mushy I have found. Do you mean cut it in half first. Then cut in in slices like a cantaloupe? I cut mine into 1-1 1/2″ thick circles & then bake if I’m not going use each half as its own “boat” of spaghetti. ? Salt it after you cut it? Kathy , step away from the squash and the kitchen. I like your instructions! Thank you.